You are following 30 restaurants. This is the maximum number of restaurants you can follow. Would you like to follow Rudolfs ? If you follow a restaurant, you'll get its daily lunchtime offers on your personal start page. You're following Rudolfs and will get its daily lunchtime offers on your start page. The admin area is currently available only in German. The restaurateur area is currently available only in German. Automatic translations may contain minor inaccuracies. We cook fresh food every day and every hour. So regional, so organic, as seasonal as it is sensible and possible. In Rudolfs variety and variety play a particularly important role. That's why every week a new menu of dishes awaits you. In addition to our meat and fish dishes, there are always two vegetarian and two vegan dishes. Every day you can expect fresh salads and dressings at our salad bar. Vegetarian and vegan dishes are clearly marked. If you are allergic, our service staff will be pleased to advise you. Also the sweetness comes in Rudolfs not too short. At our cake buffet you will find numerous home-baked cakes and fine treats from our in-house pastry shop. Our coffee is only fair and organic. We buy the beans from the café, a workshop for people with disabilities. 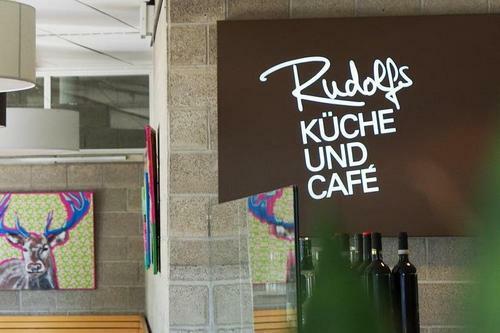 Diversity is lived in Rudolfs Küche & Café - in location, cuisine and composition of employees. At any time and in all areas, we employ people with mental illness. They are supported by specialist staff from the Rudolf-Sophien Stift in Stuttgart. The Rudolfs is not an experiment, but lived inclusion. We offer many people the opportunity to return to the workplace after surviving a mental crisis. Due to events or operational closing days, the opening hours shown here may vary. Current information on our website. Come and visit us - we look forward to your visit!